The presidential election of Donald Trump has rekindled hopes for a U.S. recovery. The new president promises to ‘make America great again’, partly by creating many millions of new jobs for U.S. workers, and judging by the rising stock market, capitalists seem to love his narrative. But if Trump actually delivers on his promise, their attitude is likely to change radically. 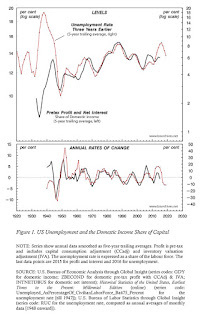 In our 2016 paper, ‘A CasP Model of the Stock Market’, we developed the concept of a ‘CasP policy cycle’, the idea that government policy, insofar as it caters to the imperative of capitalized power, favours low employment growth in order to enable low rates of interest and sustain the capitalist share of income. If Trump proceeds with and succeeds in reversing this CasP policy cycle, his authoritarianism may end up undermining rather than boosting capitalized power. In this sense, his regime could well mark the beginning of the next major bear market. Let me begin by stating this, Jonathan and Shimshon aren’t some Marxist utopian quacks. They fully understand neoclassical economics and its limitations in explaining power structures and what really drives the financial and economic world order. They published a book, Capital as Power, that offers a radical alternative to the conventional theories of capitalism. Also, before becoming a professor of political economy at York University, Jonathan worked a few years at BCA Research covering emerging markets with George Archer and Chen Zhao. He knows all about markets and the traditional way of analyzing economies and financial markets. But his and Shimshon’s analysis of the economy is far deeper than anything you’re going to read at BCA or any other investment and economic research outfit. And unlike many academics, Shimshon and Jonathan use economic and financial data to create great charts that support their points and to draw inferences on how power structures impact the stock market. Well then, go read nice papers from Morgan Stanley, Goldman Sachs and others, but if you really want to be challenged to think about the world and what really is behind stock market moves, you should invest some time to read these papers, they will open your eyes to another level of thinking about the way capitalism really works and how this impacts employment, rates, inflation and the stock market (at the very least, you will understand why winter is coming on stocks!). Are these papers similar to Bridgewater’s “epic” study, Populism: The Phenomenon, put out earlier this year? No, they are much deeper and offer a lot more insights than anything Bridgewater has put out on what exactly is going on right now. To be blunt, these are the papers that Ray Dalio and company should be reading to understand how the “economic machine” really works in the world we live in and it’s definitely the type of stuff that George Soros can appreciate, especially in his old age. The presidential election of Donald Trump has rekindled hopes for a U.S. recovery. The new president promises to ‘make America great again’, partly by creating many millions of new jobs for U.S. workers, and judging by the rising stock market, capitalists seem to love his narrative. But if Trump actually delivers on his promise, their attitude is likely to change radically. 1. What if Unemployment Falls and Employment Growth Accelerates? First, the capitalist share of domestic income will probably drop precipitously. Figure 1 – an up-to-date version of a chart first published in Nitzan and Bichler (2014a, 2014b) [link] [link] – shows why. 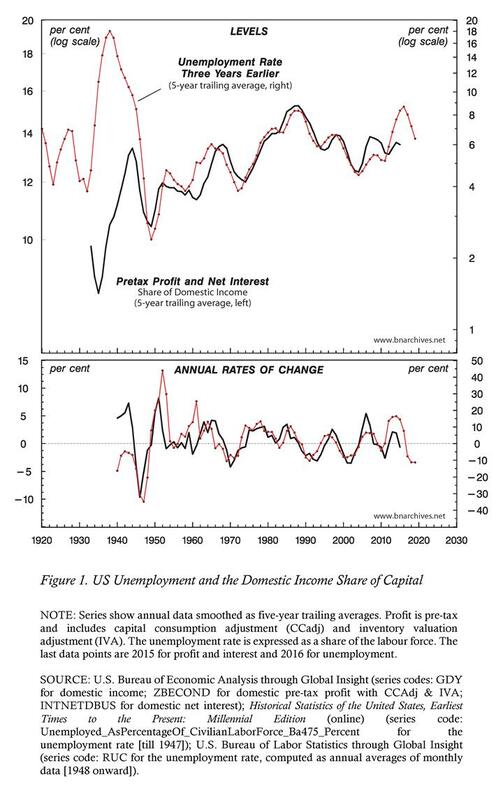 The top part of the chart plots the sum of pretax profit and net interest as a share of domestic income on the left scale, along with the unemployment rate three years earlier on the right. The bottom part of the chart shows the annual rates of change of these two series (with all data smoothed as five-year trailing averages; click on image). The historical facts here are rather unambiguous: since the 1940s, lower rates of unemployment have been followed, three years later, by a lower capitalist income share. And if this relationship continues to hold, the implications for capitalists are doubly negative. Since unemployment has already been trending downward for the past few years, the capitalist income share is likely to lose further ground in the three years ahead quite independently of Trump’s policies. And if these policies end up delivering even lower rates of unemployment, the capitalist income share is likely to shrink further. Second, a significant rise in employment will probably kill the stock market. Figure 2 – taken from our paper ‘A CasP Model of the Stock Market’ (Bichler and Nitzan 2016: 146) [link] – compares two series. On the left, it plots the ratio of stock prices to the wage rate, an index for the power of capitalists relative to workers. 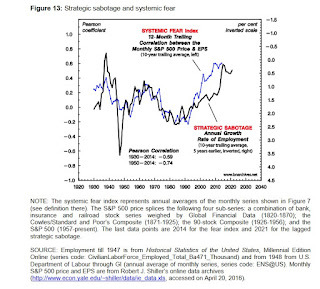 On the right, it displays the rate of growth of employment five years earlier, an inverted proxy for the strategic sabotage inflicted on workers (the two series are smoothed as ten-year trailing averages; click on image). 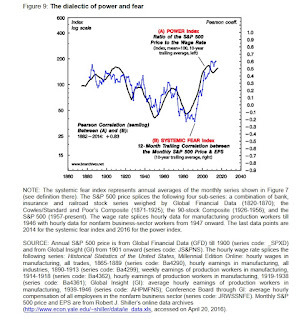 And here too the historical regularity seems clear: since the 1940s, rising employment growth has been followed, five years later, by a falling stock market (since the wage rate is usually a monotonically rising series, most of the movement here comes from changes in stock prices). With this pattern in mind, investor enthusiasm for employment growth policies seems somewhat misplaced: if the Trump administration succeeds in reversing the 30-year downtrend in employment growth, the likely result will be not a secular bull run, but a major bear market. Over the past thirty years, U.S.-based capitalists (and others investing in U.S. equities) have managed to increase their capitalized power relative to the underlying population from record lows to record highs [Figure 2 above]. In our view, this increase has been driven by two related processes: (1) a redistribution of income from non-capitalists to capitalists, along with a growing conviction that the resulting inequality could be maintained and even augmented in the future; and (2) mounting strategic sabotage in the form of lower employment growth. [. . . The] first process meant a higher hype coefficient [i.e., overly optimistic long-term profit expectations] The second process has had a double impact: on the one hand, it assisted the first process by restricting wages and boosting profits, while, on the other, it enabled looser monetary policy and lower interest rates, thus helping to reduce the normal rate of return [and raising the discounted value of expected future profit]. How do Trump’s hyped rhetoric and proposed policies fit into this framework? On the face of it, his authoritarianism, apparent disdain to the rule of law and promiscuous endorsement of violence make him a possible harbinger of the much harsher regime needed to secure and possibly extend current levels of capitalized power. This harsher regime, though, would have to cater to capitalist interests, and so far, Trump’s proposed policies point in the opposite direction. Modern capitalism is guided by differential capitalization – particularly differential stock prices – and differential stock prices are driven not by rapid economic growth, but by the ability of owners to increase their capitalized power relative to the underlying population. As noted, since the 1980s, the differential capitalized power of stock owners increased due to a combination of a rising capitalist income share and falling interest rates, and taken at face value, Trump’s policies threaten both. As we have shown in Figure 1, Trump’s focus on job growth stands to undermine the capitalist share of income. But job growth is likely to hurt capitalists in another important way – namely, by causing interest rates to soar and in so doing further undermining equity prices. The history of this latter process is illustrated in Figure 3 (updated from Bichler and Nitzan 2016). 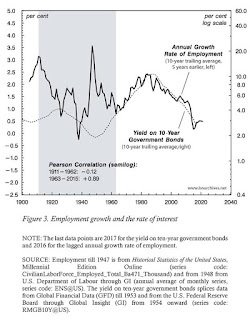 The chart shows two series: the annual rate of growth of employment (lagged five years) plotted against the left scale and the yield on ten-year government bonds on the right. We can see that, until the middle of the twentieth century, there was little or no connection between the two series (Pearson coefficient of –0.12). 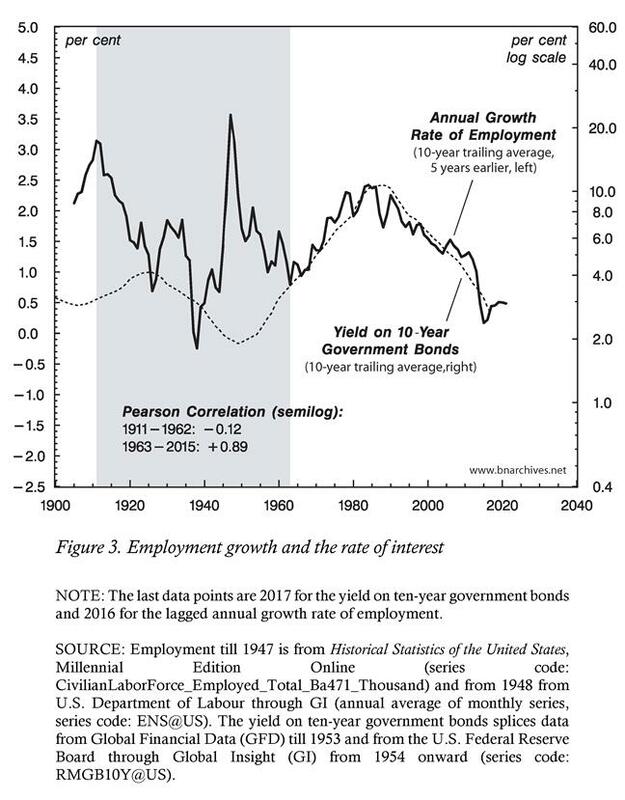 But from the early 1960s onward, with the entrenchment of countercyclical Keynesianism, employment growth has become a nearly perfect five-year leading predictor for interest rates (with a Pearson correlation of +0.89). 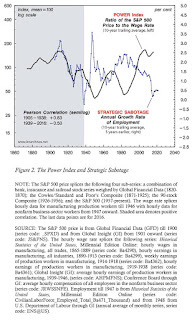 During the 1960s and 1970s, the welfare-warfare state lessened the strategic sabotage on the underlying population and accelerated employment growth, but this process triggered higher interest rates that grounded the stock market. The 1980s rise of neoliberalism, though, flipped the cycle. 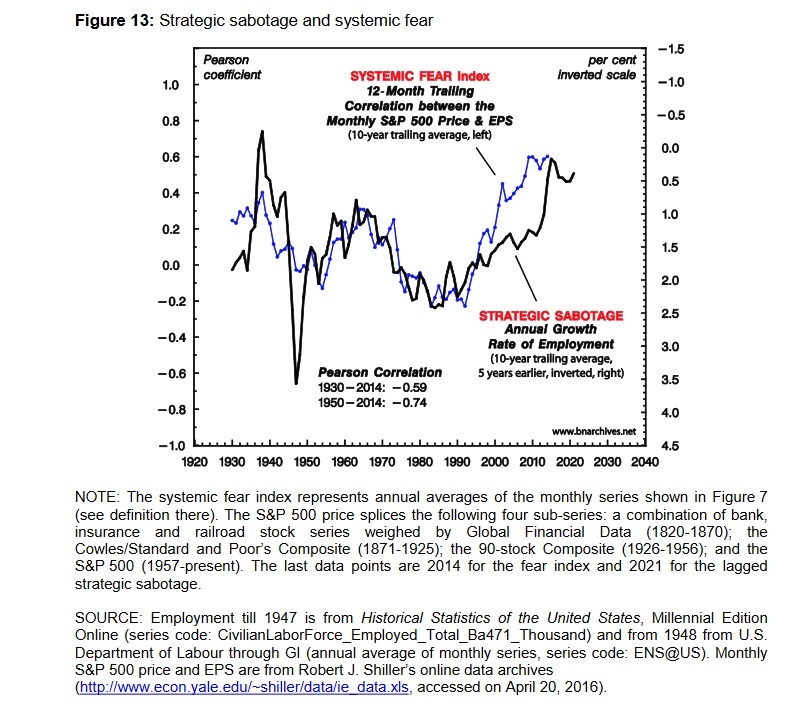 Employment growth decelerated, interest rates dropped, and the capitalized power of owners, fuelled by growing strategic sabotage and rising liquidity, soared (click on image). In our ‘CasP Model of the Stock Market’ (2016) [link], we developed the concept of a ‘CasP policy cycle’, the idea that government policy, insofar as it caters to the imperative of capitalized power, favours low employment growth in order to enable low rates of interest and sustain the capitalist share of income. If Trump proceeds with and succeeds in reversing this CasP policy cycle, his authoritarianism may end up undermining rather than boosting capitalized power. In this sense, his regime could well mark the beginning of the next major bear market. London, Jack. 1907. . The Iron Heel. New York: Hill and Wang. Nitzan, Jonathan, and Shimshon Bichler. 2014a. Can Capitalists Afford Recovery? Three Views on Economic Policy in Times of Crisis. Review of Capital as Power 1 (1): 110-155. Nitzan, Jonathan, and Shimshon Bichler. 2014b. Profit from Crisis: Why Capitalists Do Not Want Recovery, and What That Means for America. Frontline, May 2, pp. 129-131. Now, I’m not concerned about President Trump undermining rather than boosting capitalized power. Importantly, if you look at his closest economic advisors, they are all part of the financial elite like his friend Stephen Schwarzman, CEO and co-founder of private equity powerhouse Blackstone, so you can rest assured his administration will keep on trying to boost capitalized power. I wouldn’t read too much into this latest employment report. Employment is a coincident economic indicator, not a leading indicator, but this will provide the Fed an excuse to raise rates at least one more time. The Fed wants to raise rates to have ammunition when the next crisis strikes. And there will be another crisis, that much I can guarantee you. The next economic shoe is dropping in the US at a time when the rest of the world is very fragile. Will Kyle Bass be right about China’s looming credit crisis? He was spectacularly wrong on Japan but he might be right about China. And remember a crisis in China will reinforce global deflationary headwinds, which is music to capitalists’ ears as long as it doesn’t develop into a full-blown debt deflation crisis and Great Depression type high unemployment. I told him that I see a bleak future where inequality gets much worse (due to rising unemployment and pension poverty, technological advances, etc. ), debt deflation, one crisis after another (China, Europe, etc.) and something is going to give eventually or else the system will implode. Basically, when systemic fear is high, like now, capitalists look at current, not future profits. 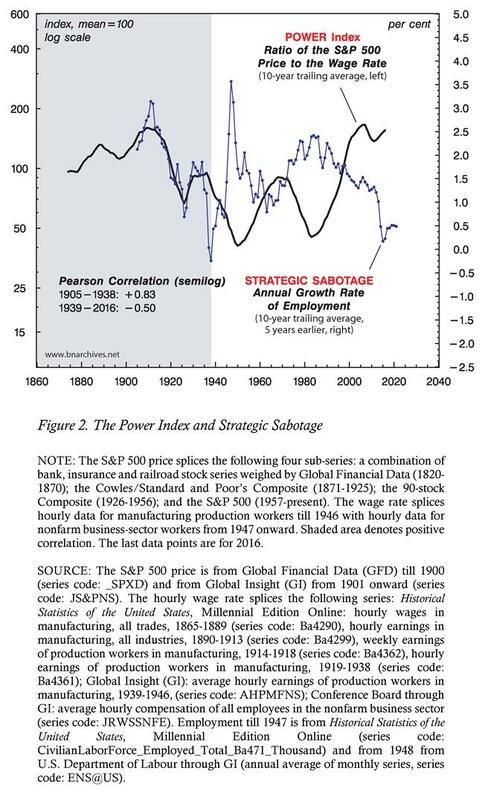 The first chart does not bode well for stocks going forward and the second one doesn’t bode well for employment growth, so expect some type of ‘strategic sabotage’ to maintain capitalists’ hold on power. Take the time to carefully read A CasP Model of the Stock Market, it is excellent and has a lot of information for everyone, including institutional investors. Finally, Jonathan and I discussed the pension crisis and he thinks pensions can be part of the solution to limit inequality, democratize housing and curtail the disastrous effects of stock market crises. You can read his and Shimshon’s thoughts here. I hope you enjoyed reading this weekend comment. Please remember to kindly donate or subscribe to this blog on the top right-hand side under my picture. All donations, big or small, are welcomed and I thank all of you who contribute to this blog. 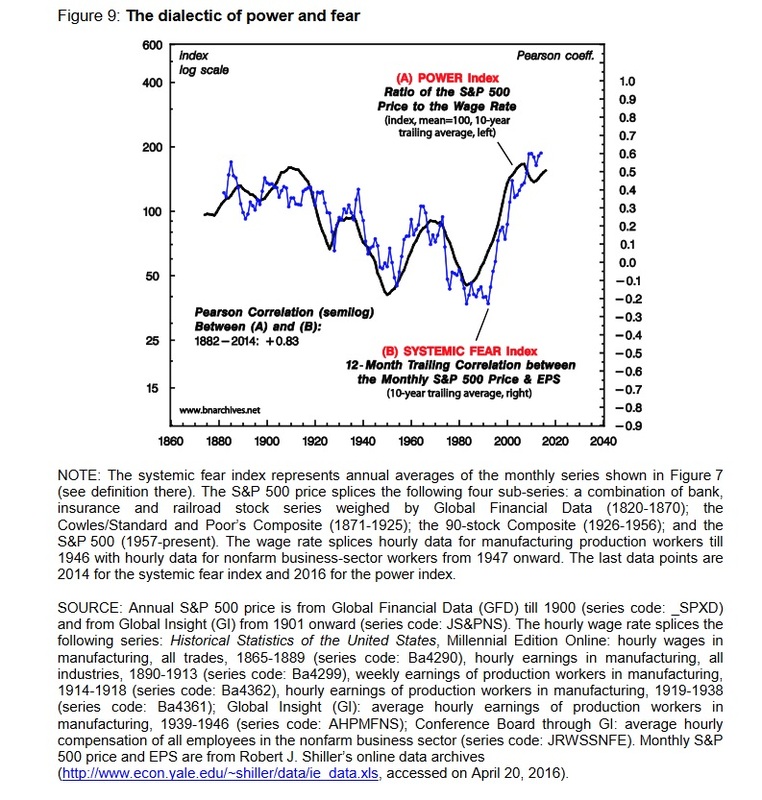 Below, Jonathan Nitzan’s presentation on A CasP Model of the Stock Market. Take the time to listen to this presentation, it’s not straightforward but I think Jonathan does a great job explaining his and Shimshon’s theory on capitalized power, how it’s intertwined with systemic fear and strategic sabotage. You can track Jonathan and Shimshon’s latest work here. Also, Kyle Bass, Hayman Capital Management’s chief investment officer and managing partner, discusses China’s economy and the global risks to financial markets with Bloomberg’s Erik Schatzker at the Milken Institute Global Conference. Leo Kolivakis is an independent senior analyst with years of experience working on the buy and sell-side. He has researched and invested in traditional and alternative asset classes at two of the largest public pension funds in Canada, the Caisse de dépôt et placement du Québec (Caisse) and the Public Sector Pension Investment Board (PSP Investments). You can track him on Twitter (@PensionPulse). Email at LKolivakis@gmail.com. Read other articles by Leo, or visit Leo's website. This article was posted on Sunday, May 7th, 2017 at 8:30am and is filed under Capitalism, China, Currency, Donald Trump, Economy/Economics, Money supply.